In western and southern Britain E. latimana is mainly restricted to coastal habitats though its range also extends inland, especially in the east. The most northerly populations known are on the Ainsdale sand dunes in Lancashire. E. latimana has not been recorded from Ireland. In Europe the species does not range as far north as the very closely related E. ovata but extends further south, even into north Africa, and from the Atlantic coast across into central southern Russia (Oxford & Reillo 1994). Like E. ovata, E. latimana has been introduced into North America, but except for one record from south-eastern Canada, is more or less restricted to the western seaboard of the northern United States and southern Canada (Oxford & Reillo 1994). In Britain E. latimana occupies the more open, drier and sunnier end of the habitat spectrum utilised by E. ovata. The reasons for the species' apparent association with coastal habitats in western and southern Britain, but not in eastern England or elsewhere in continental Europe are not clear. On the Continent, E. latimana and E. ovata are found together more frequently than they are found separately (Oxford & Reillo 1993). Perhaps the warmer and drier climate of continental Europe allows the species to co-exist in a wider variety of habitats. The life history of E. latimana is similar to that of E. ovata but with maturity occurring a few weeks later (Snazell 1983; Oxford 1992), adults of both sexes occurring mostly in July and August. This species exhibits similar colour polymorphism to its sister species (q.v.) 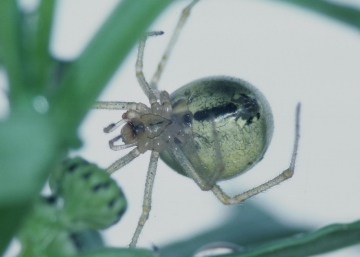 (Oxford 1992) but whereas the lineata and redimita forms are found in virtually all populations, few individuals of the ovata form have ever been recorded. Usually an abundant species wherever it occurs. Original author of profile: G. Oxford.